This map is supposed to be an accurate representation of WWII with territories and bonuses aimed toward creating a balance custom world. There are 8 major 1942 countries to play in the 1942 distribution. It is advised that small countries such as Liberia, Hungary, Nepal and others should be incorporated into their neighboring allies. A 1939 senario distribution is also possible but is unbalanced with the Allies having a major advantage over the Axis. Bonuses should be altered in a custom 1939 historical game to give each team a fair chance. Review by RainB00ts on 9/15/2018. The concept is promising but the execution failed to deliver a map that lives up to the scenarios designed for it. The biggest flaw is the construction of bonuses. One entire bonus for Germany, UK, Japan? That means those countries will be out of the fight if an enemy so much as sets foot in their territory! 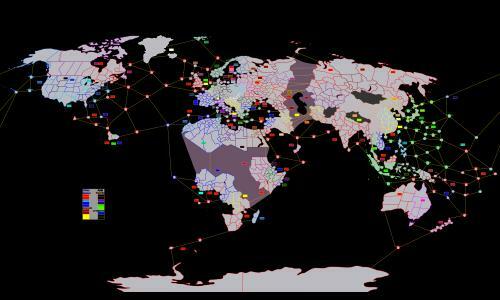 This map would simulate real war and in addition play much more strategically if the great powers were divided into many bonuses. The scenarios won't play well at all on the map as it is. The fact that the mapmaker didn't realize this makes me think they didn't play test games on their map. There are a few errors like inner Mongolia being in the wrong place and probably more since the mapmaker clearly didn't go through with a fine comb. A WWII theaters map is a good idea, but this just doesn't work. Thanks for the feed back. I have fixed Inner Mongolia and altered most of the larger bonuses that I deemed necessary to have an equal potential loss of troops per turn. Also I did over 5 test games. Review by varikor on 9/14/2018. Any suggestions on improvements will be gladly received and will be added if deemed fair. Review by Jon Keaton on 9/26/2018. Thank you very much, I have fixed all problems. Review by kelly on 2/15/2019.